People have been using phones as a means of distant voice communication for more than a century now.Using phones has become sort of a usual thing. We use the phones almost every day and just about everywhere At home, at work,outside,in our cars and so on. speech quality as the benchmark for assessing the overall quality of a network. Regardless of whether or not this is a subjective judgment, it is the key to maintaining subscriber loyalty. For this reason, the effective removal of hybrid and acoustic echo inherent within the digital cellular infrastructure is the key to maintaining and improving perceived voice quality on a call. This has led to intensive research into the area of echo cancellation, with the aim of providing solutions that can reduce background noise and remove hybrid and acoustic echo before any transcoder processing. By employing this technology, the overall efficiency of the coding can be enhanced, significantly improving the quality of speech. This tutorial discusses the nature of echo and how echo cancellation is helpful in making mobile calls meet acceptable quality standards. Echo cancellation involves first recognizing the originally transmitted signal that re-appears, with some delay, in the transmitted or received signal. Once the echo is recognized, it can be removed by 'subtracting' it from the transmitted or received signal. This technique is generally implemented using a digital signal processor (DSP), but can also be implemented in software. 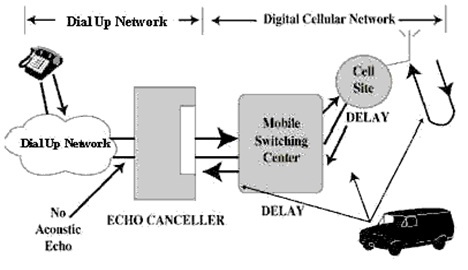 Echo cancellation is done using either echo suppressors or echo cancellers, or in some cases both Echo cancellation is the process of removing echo from a voice communication in order to improve the voice call quality. Echo cancellation is often needed because speech compression techniques and packet processing delays generate echo. There are 2 types of echo: acoustic echo and hybrid echo. The late 1950s marked the birth of echo control in the telecommunications industry with the development of the first echo-suppression devices. These systems, first employed to manage echo generated primarily in satellite circuits, were essentially voice-activated switches that transmitted a voice path and then turned off to block any echo signal. Although echo suppressers reduced echo caused by transmission problems in the network, they also resulted in choppy first syllables and artificial volume adjustment. In addition, they eliminated double-talk capabilities, greatly reducing the ability to achieve natural conversations. People have been using phones as a means of distant voice communication for more than a century now. Using phones has become sort of a usual thing. We use the phones almost every day and just about everywhere: at home, at work, outside, in our cars and so on. A big thanks goes to the cellular phones, which set us free from wires! Although we all enjoy this remarkable possibility to talk on the phone, there's always something we'd like to be better. This something is the speech quality in the phone conversations. The speech quality has always been an issue for both the phone network service providers and their subscribers. There are several reasons for the undesirable quality degradation and the appearance of audible echoes is one of them. This kind of quality degradation is inherent in the network equipment and the end-user phone devices. Today it is easy to implement echo cancellation on DSPs and this is what engineers are doing in their devices. However, many of them face certain difficulties with achieving echo cancellation because of incomplete understanding of the echo cancellation principles and not meeting the requirements imposed by the echo cancellers. 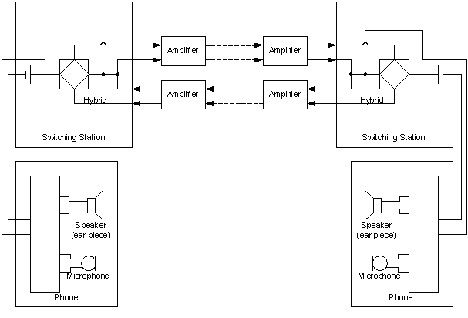 The purpose of this article is to demystify the topic of the echo cancellation by explaining its basics and providing useful information for those engineers, who need to implement the echo cancellation in their devices. We shall see where the echoes come from, how to fight them and what the known problems with the echo cancellation are. The information provided herein is based on the experience of developing echo cancellers and supporting echo canceller customers at SPIRIT Corp.The above network is indeed simple and it can operate very well provided the distance between the abonents is short. Now, if we want to make calls between very distant abonents, we need to do something about the signals because of their attenuation in the long lines. So, we need to amplify the signals. But we can't just amplify what is being sent and received over the 2-wire line because there are both signals coming in both directions at the same time. The solution to this is amplification of separated send and receive signals from the 2-wire line. Such a separation is performed by a dedicated electrical device, called a hybrid. The hybrid basically provides a conversion between 2-wire and 4-wire lines (the switching stations are now connected with 4-wire lines). Another reason for signal separation is that the signals can be transmitted over digital networks between the switching stations. Digital transmission improves the quality of the calls and increases the capacity of the phone networks due to digital signal compression. This makes a more efficient use of the network equipment. I found an online certification course. Its by IIT Kharagpur, one of the most famous and prestigious institutes in India. You get a certificate from IIT Kharagpur at your home and learn about Image and Video Communication, VLSI Architecture, MPEG Standards, Speech Coding, Softwares etc. I found it interesting. Please let me know if i should take up this course. I'd like to know more about this. Can anyone send me the matlab code for echo cancellation?